The last Monday of May is commemorated by the U.S. citizens as the U.S. Memorial Day. This day remembers the brave-hearts and salutes those soldiers who have laid down their lives for their motherland. Let's pay respect to these courageous men in its own special way. Thematic wallpapers, greeting cards are available here to pay homage. To make the day more interesting and memorable you can try out the quiz game, puzzle activities here and can gorge in the facts, songs and exclusive articles related to this event. Make the most of the free resources here and make your journey of the Memorial Day section an enriching experience. Check out the origin of this solemn occasion and the reason behind the formation of this annual U.S. holiday. Go through these little bits of information related to this Day and enhance your knowledge. Send these beautiful e-greeting cards to your friends and loved ones and share the spirit of the day. A collection of wallpapers and backgrounds for the day. Download for yourself or send to fellow Americans. Get into the spirit of the occasion with these unforgettable quotations on courage and sacrifice. Read these soul-stirring poems based on battle and soldiers by some of the greatest war poets. 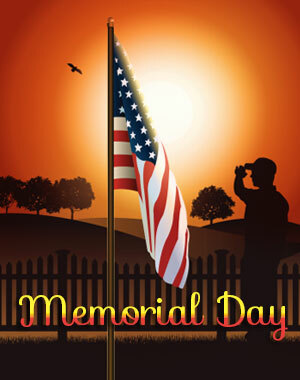 Print out attractive images related to memorial day and paint them in the colors of your choice. Use these ingenious directions to construct thematic crafts for the occasion. Go through the lyrics of some immortal American patriotic songs and be proud of your nationality. Check out these memorable Memorial Day proclamations by U.S. Presidents in the last decade. We recommend you these awesome flicks for a pleasurable Memorial Day watch. Try solving this thematic exciting quiz game with all your knowledge about this event. These enchanting puzzle activities are going to help you get into the mood of the occasion. Pass on this thought-provoking message to your dear ones and share the spirit of the day.